I’m finally getting around to sharing the first birthday party shenanigans from earlier this month. I must admit, I’m beyond excited to share this post with you guys! By far, this party has been the most fun DIY project to date, if you’re into the planning, stressing and hot gluing craze. So, let’s get down to business shall we? 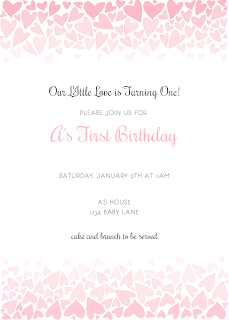 I selected a Pink and Gold birthday theme with lots and lots of hearts. A is the love of our lives. So I wanted to really show that throughout the party. To start, I found this awesome little website, The Little Umbrella, that offered a large selection of printable for a small yearly fee. After doing a ton of research on invitations, I decided that this was the best deal as far as price and what we were able to access. If you have a party coming up, I highly recommend checking them out. They had a beautiful ombre hearts suite that was perfect for our party. And creating our own custom piece was a breeze. *One piece of advise I want to share with all you moms out there. I’ve noticed this dilemma with several birthday parties lately and I made sure to take note when selecting the time for our birthday party. I chose a time that was in between A’s natural nap times. Even though she didn’t get a great nap, we still avoided that fussy period and everyone enjoyed them selves. Since I selected 11AM, that helped me decide to go with a brunch for food selections. I will touch on that more a little later. Decorations were kept simple and easy to DIY. I used a gold heart bunting to drape around the counters and tables. You will see a how-to for this project a little later in the week. This is also a perfect little project for valentine’s which is coming up soon. So make sure to check back often. I also found this love sign at Hobby Lobby and used some gold craft paint to give it some color. 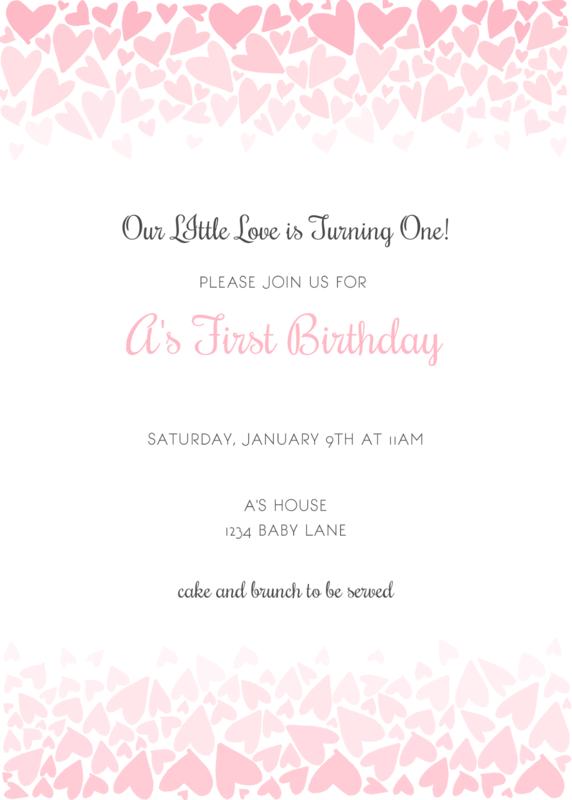 Then I just tossed A’s pictures from her First Birthday Photo Shoot into some white frames to top off our “love” theme. I was very much on the fence about having a chalkboard sign created for A’s party. But, while I was browsing through the Dollar Tree one afternoon, I saw some black poster board and decided I could give it a try myself. If it turned out crappy, no money was wasted. I loved how it ended up turning out. It was quite simple to do myself. I just used a couple of chalk pens and a straight edge. I also created this cute little heart wreath out of some pink yarn, a foam wreath and glued an extra gold heart to the bottom. We used the mantle to display all of A’s monthly photos I had taken throughout the year. I used a piece of jute and some small clothes pins to pin them up. A very cute and simple project. In our family room, I set up a little area for A to unwrap her gifts. Thanks to her Pepaw and Mimi who helped create this cute little pink and gold teepee, we flanked it with furniture pieces we needed to move for the party as Gift tables. Brunch was served to all of our guests buffet style. I chose simple to make and store bought items to help me stress less. The only item we actually cooked were the heart shaped pancakes, which I cut out with cookie cutters, and the palmiers. With the many diet preferences, I wanted to make sure all of our guests enjoyed some fun treats. For the cake, we went with simple, help-yourself cupcakes in Red Velvet and Chocolate. We also included a drink station with water, orange juice, coffee and hot cocoa with all the fixings. Then, we made it to the cake smash event! A had a little practice earlier in the week on her actual birthday. That made this smash so much more fun. She really dug in. Now, to share the love with all the wonderful people who helped make A’s day so special!! If you are loving what you see and have an event coming up but need help planning, organizing and/or setting up, contact me. I would love to help in any way you need.